Male singing group Maasinhon Trio’s rendition of Basil Valdez’ classic OPM hit “Nais Ko” was voted as the best act by Filipinos here and abroad in the intense season finale of the country’s number one talent-reality show “Pilipinas Got Talent” held recently at the Ynares Sports Center. ”We are very happy. We just proved that talent doesn’t come with age,” said Andrew Sanchez. The Maasinhon Trio, who is also the oldest grand winner for PGT, garnered 22.59% of the total text and online votes to be declared winner of the “Pilipinas Got Talent” season 3. The winning group was followed by 15 year-old singer Khalil Ramos with 18.64% and the acoustic singers Bringas Brothers with 14.03%. As runners up, Khalil and the Bringas Brothers received P100,000 each. Hailing from the humble town of Maasin City in Southern Leyte, Andrew and fellow members Bonifacio Salubre and Licinio Lolo won the grand prize of P2 million and made history as the first act from the Visayas to win the competition following season one’s Jovit Baldivino and season two’s Marcelito Pomoy, who both came from Luzon. As early as audition week, the Maasinhon Trio already captivated the judges with their flawless blending and harmony when they sang “Kay Ganda ng Ating Musika.” The trio blew everyone away come semi-finals when they sang the song “Bituing Walang Ningning.” Queen of All Media Kris Aquino even quipped “you are perfection” after their semi’s performance. 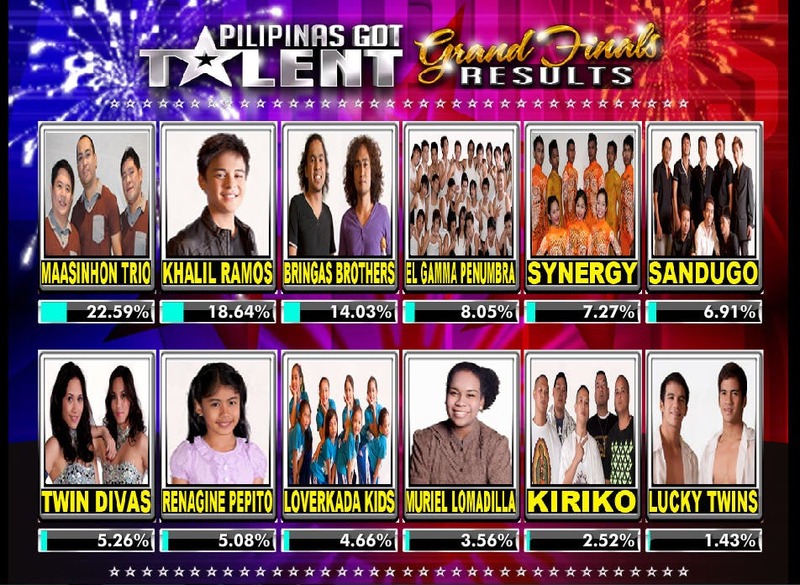 Other grand finalists include El Gamma Penumbra (8.05%), Synergy (7.27%), Sandugo (6.91%), Twin Divas (5.26%), Renagine Pepito (5.08%), Loverkada Kids (4.66%), Muriel Lomadilla (3.56%), Kiriko (2.52%), and Lucky Twins (1.43%). They all received P50,000 as consolation prize. The live results night of “Pilipinas Got Talent” season 3 in Ynares Sports Center in Antipolo City got even more exciting with superb performances from celebrity guests Gary Valenciano, Paolo Valenciano, Jed Madela, Christian Bautista, Nina, Vina Morales, Frenchie Dy, Ryan Bang, Jhong Hilario, Bugoy Carino, Kamikaze, and PGT season one and two grand finalists Velasco Brothers, Nielbeth, Freestylers, and Happy Feet.